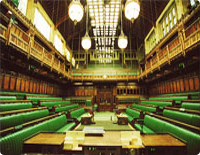 Leyton and Wanstead MP, John Cryer initiated a House of Commons debate about how the Government cynically attempted to suppress a public survey that reports an all time high in public satisfaction with the NHS. John Cryer MP said: "The coalition Government attempted to hide the good news to service their claims that the NHS is not working and needs reorganising." "The Ipsos MORI/DH Perceptions of the NHS Tracker has been carried out every six months since 2000. It emerged recently that the last set of published results from a survey carried out March 2010 but reported to the new health ministers after the election in autumn, were being withheld the Department." "Some analysts have accused Ministers of ‘burying good news' to help justify their NHS re-organisation. The poll data was published on Friday 25 March 2011, a day after I was given this debate. It might be coincidence but it struck me that it was fairly good time to release the news: it was the day before 500,000 people marched in opposition to the cuts." "The data release came only after Labour MPs demanded the publication of the poll results. The Health Secretary originally refused to release the data." "Since 1997 we have seen a huge improvement in the NHS. The Tory Liberal Democrat Government have broken their promises on the NHS. promises Cameron and Clegg are embarking on a reckless policy to restructure the NHS which we feel is privatisation by the back door." The Ipsos-Mori polling shows a record 72 per cent satisfaction rating with the NHS. This level of satisfaction has now been sustained for over a year making the public perception of the NHS a real success story. John Pugh, Liberal Democrat MP for Southport, attended the debate and said: "We (the Government) should not bang on about the cardiovascular field. I had unnerving experience the other day of listening to the Prime Minister at PMQs telling MPs how poor our outcomes were when compared to other comparable countries." Later, I attended an event organised by the British Heart Foundation to celebrate world beating progress. That was a very puzzling experience." Tony Baldry, Conservative MP for Banbury also attended the debate and dismissed the British Medical Association's concerns about the ‘dangerous' reforms. "The views of the trade unions on all this are as depressing as they are; perhaps, predictable ..........in this I place the BMA. help the NHS. They are asking GPs to take the main responsibility with the GP Consortia replacing PCTs and then they are shamefully ignoring them and describing the concerns as depressing and predictable." "Yet, having said this I welcome the intervention from the Member from Southport who candidly questions the validity of some of the Government's myths about the NHS." "All current surveys show a positive shift in the public's perception of the NHS. Pride in the NHS also continues to climb and is at its highest recorded level." "I called for this crucial debate to hold the Government to account. We all know what the Conservatives think of the NHS - Daniel Hannan Conservative MEP recently described the NHS as a 60 year mistake." NHS but they are looking to cut funding for future sources of NHS performance indicators and public satisfaction levels. The three surveys are ‘Public Perceptions of the NHS and Social Care', the ‘general lifestyle survey' by the Office for National Statistics, and the ‘British social attitudes' survey by the National Centre for Social Research." "The Tory/Lib Dem government are attempting to prevent scrutiny of their NHS policy while failing to inform MPs of this policy through the proper parliamentary procedures." "The Health Minister apologised about the withholding of the survey results and cited wrong advice. This is all fine but in short - not acceptable. We know their policy and it is wrong and out of step with the public." "Like Bevan said ‘the NHS would last as long as there were folk left with the faith to fight for it.' We intend to fight for it. But we do so not just with faith on our side but with the facts as well."